Bundle and save. 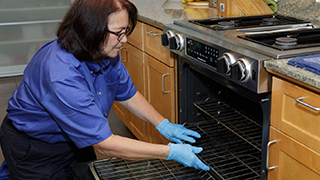 For $179.99, we’ll perform a 33-point inspection on your refrigerator, dishwasher and oven. 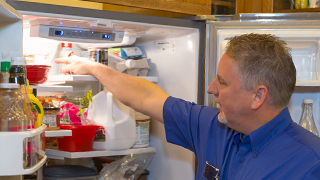 Why is maintenance important for kitchen appliances? Regular maintenance of your kitchen appliances can help prevent costly breakdowns, reduce energy costs and extend the life of your appliances. Didn’t buy them at Sears? Not a problem! Our technicians know all the top brands. Our experienced techs will complete all the tasks listed below for $179.99. Savings are obtained with the multiple appliance packages vs. the individual regular price of $99.99 each. Tax and all parts and labor for repairs (if needed) are extra. Inspect electrical system for proper ground and secure connections. Visually check readily accessible wiring insulation for cracks or peeling. Heat check oven controls for accurate temperatures. Check oven door and door gasket for proper alignment. Make sure gasket is clean and soft. Level range as needed and make sure the anti-tip device is installed. Check and adjust clock/timer as needed. Check electronic controls to ensure proper functions. Test gas line and connections for leaks. Check warming drawer operation and alignment. Check and properly adjust thermostat, temperature controls, and air dampers. Check the automatic defrost cycle. Check door seals for air leaks. Check defrost evaporation pan and clean if applicable. Check the defrost drain for blockage and leaks. Check for proper icemaker operation. Check ice dispenser (if applicable) for proper operation. Check water dispenser (if applicable) for proper water flow. Check pump and motor shaft for leaks. Clean pump and spray arms. Check water distribution. Check and clean dispenser operation. 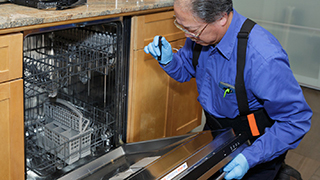 Ensure correct amount of water enters the dishwasher. Check door gasket to prevent leaks. Inspect and clean removable filters. Check electronics controls / buttons for proper function.